USD has been empowered all across the market and it managed to knock out the strong EUR. The support rests at 1.22880 with resistance at 1.23440 which both lines are above the weekly pivot point at 1.22750. The EMA of 10 is moving with bearish bias in the descendant channel and it is above the EMA of 100 and the EMA of 200. The RSI is moving below the 50 level, the Stochastic is moving in low ranges, showing downward momentum and the MACD indicator is in the neutral territory. The ADX is showing buy signal. 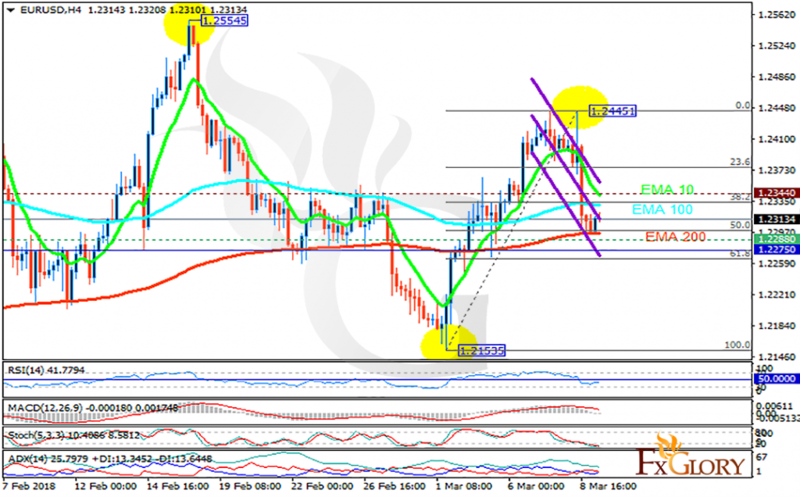 The NFP data will influence the market however, it seems that EURUSD has fallen enough reaching towards the 50 level of Fibonacci; therefore regardless of the NFP data, we will remain bullish targeting 1.25.